Chronos Business Card Shop - Make a great first impression - in business and life. Business Card Shop is the #1 best-selling business card software for Macintosh. It includes everything you need to start making a great first impression. * NEW! Major interface redesign to make software even easier to use. The Smart Inspector has been replaced with dedicated inspectors in sidebar for convenient one window use. The interface has been streamlined to bring focus to the design canvas and maximize its area. * NEW! 8 photo filters: B&W, fade, warm, cool, bold, instant, etc. Business Card Shop helps you put your best foot forward with a rich collection of stunning business cards. Use one of these pre-designed cards as-is or customize to your liking. In addition to regular horizontal and vertical card templates, enjoy double-sided templates, signature card templates, and folding/tent templates. There are templates for over 210 professions. NEW 7.0 FEATURE: Built-in maps. 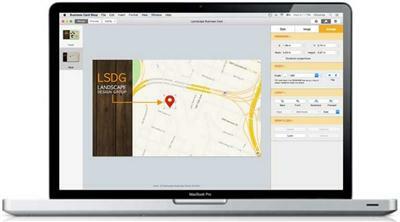 Use the built-in map tool to easily include a map of your business location on your business card. A map is a simple way to help customers find you. NEW 7.0 FEATURE: "Old film" look overlays. Apply any of 8 different overlays to give a photo an "old film" appearance. The overlays are divided into 3 categories: dust & scratches, dust, crackle. Add a little pizzazz to your business card by dragging a special effect right onto your design. Draggable effects include a customizable sunburst, sparkle, and lenticular halo as well as 13 different water stains.